Samsung has announced a new model for low-end tablets, the Lite version of the Galaxy Tab 3. It is designed to cover the niche of the basic tablets, and it will be released soon with similar specifications than the original Galaxy Tab 3. It will be available in two colors: black and white. The Tab 3 Lite displays a dual core 1.2 GHz, 1 GB of RAM and 8 GB of internal memory (expandable with SD card). The 7-inch screen has a resolution of 1024×600 pixels. The final size of the tablet is 16.4 x 193.4 x 9.7mm and it has a pretty decent weight of 310 grams. Unlike the original model, the Galaxy Tab 3 Lite only has a 2MP rear camera. To get more image functionalities, the Tab 3 Lite comes with several multimedia apps. These include the Smile Shot (which automatically takes a photo when it detects a smile), Photo & Share (to share images immediately in the social networks) and Panorama Shot (which allows you to acquire an image of a complete landscape). The battery has been reduced to 3600 mAh but it promises 8 hours of autonomy, thanks in part to the low resolution of the screen that saves battery life. 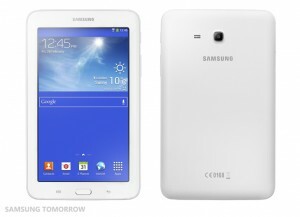 It runs Android 4.2 Jelly Bean customized with Samsung’s TouchWiz, and there will be available a Wi-Fi version and a 3G one. Now we need to wait for a while to see its final price on the market. Currently, the 7-inch Galaxy Tab 3 has a great success in the market, so this new model can fit quite well if it has an even more affordable price. Samsung is expected to put it on sale for about $100. You can find more information at SamsungTomorrow.